CoinMarketCap data showed eos climbed more than 30 percent over the last 24 hours for a market capitalization of nearly $7.1 billion, topping litecoin’s $6.8 billion. Bitcoin is the largest cryptocurrency by market capitalization, followed by ethereum, ripple and bitcoin offshoot “bitcoin cash.” Eos was trading slightly higher on the day near $8.84 as of 10:32 a.m. ET. Former Fortress hedge-fund manager Novogratz’s Galaxy Digital announced in late January a joint venture with eos developer Block.one for a $325 million fund. 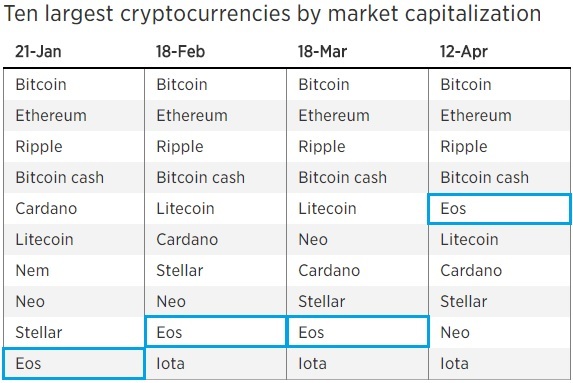 As was the case with a previous eos price surge, the cryptocurrency gains came ahead of an “airdrop” of new coins to eos holders. A group of developers who also claim involvement with the eos project are planning to distribute one eosDAC token to all accounts with at least 100 eos tokens at 1 a.m. UTC April 15, or 9 p.m. ET Saturday. Eos is a cryptocurrency for a platform set to go live this summer called eos.ios, which proponents expect could be better than ethereum in many ways and potentially bring on much greater adoption of cryptocurrency-related technology. Talk show host John Oliver criticized eos in a March 11 episode of “Last Week Tonight” that discussed the risks of cryptocurrency investing. Oliver’s concerns included the apparent lack of seriousness by advisor and noted early bitcoin investor Brock Pierce. Eos developer Block.one responded in a lengthy blog post that said Pierce has ended his role at the company by mutual agreement. It wasn’t clear whether Pierce’s departure was a result of the Oliver segment. Eos has crept higher in the cryptocurrency market cap rankings over the last few months. It wasn’t among the top 10 until late January, made ninth place in mid-March and was sixth-largest earlier this week.